Starving Artist now boasts two locations thanks to this newly opened waffle house on St. Clair. 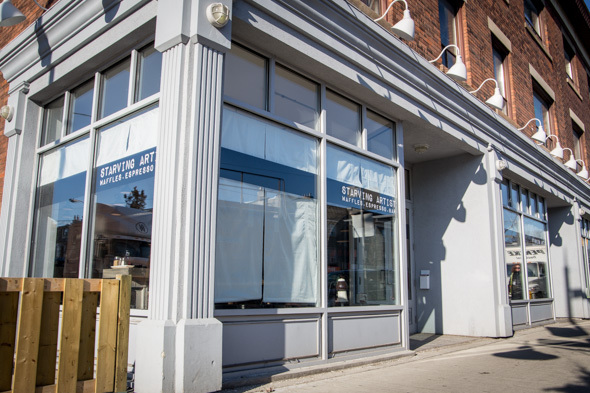 At only a few weeks old, the bright spot has already become a local favourite thanks to its spacious dining room (uncharacteristic of most brunch spots) and quick take-away coffee counter. 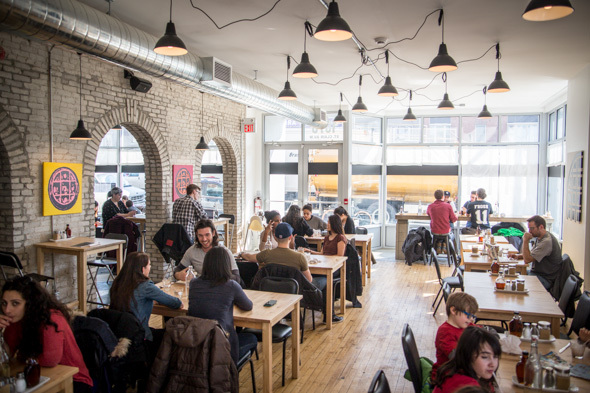 The sunny white room inherits original brick archways that divide the kitchen, espresso bar and comfy couch area from the spacious 60-seat main dining room. There's also a large side patio too, with room for another 30 come summer. On the day I visit the cafe is bustling with weekday lunchers, families grateful for the ample stroller space, and a steady stream of coffee fiends looking for a mid-afternoon fix...oh yah, and a nearby film crew has just ordered 80 waffles for take away without any notice. 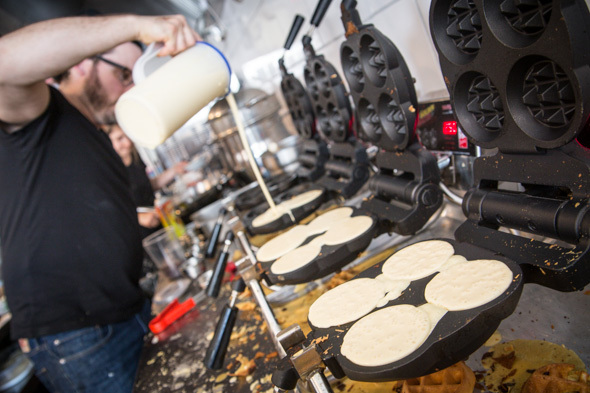 Owners Bryan Jackson and Brittany Lockhart are handling it in stride as the open kitchen puts in plain view all 12 waffle irons in overdrive. Waiting any amount of time proves to be torturous thanks the powerfully sweet smell of waffles. Solid lattes are a decent distraction or there are boozy options like Amsterdam on tap and in tall cans, plus mimosas ($7) and caesars ($6.50). 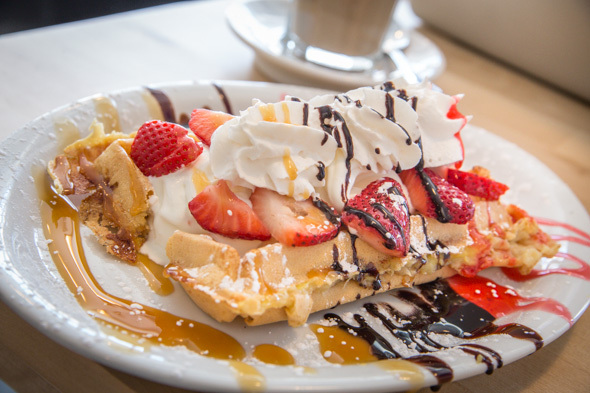 The menu is devoted entirely to waffles accounting for both sweet and savoury palettes. 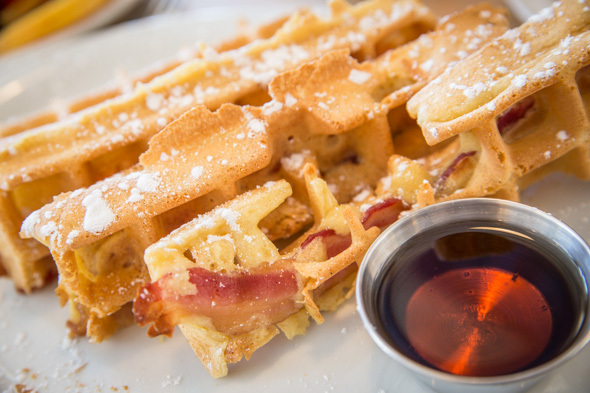 Carried over from the original location on Lansdowne , the signature waffle bacon ($6) is on the menu here too. Snack-worthy strips of bacon are battered and pressed into a waffle iron then served with maple syrup for dipping. 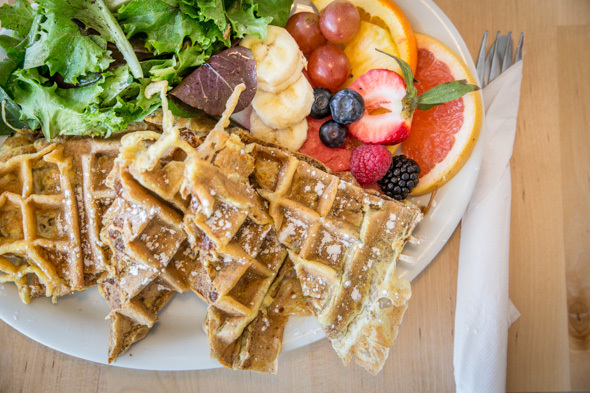 Brunch-focused foods are served all day including all the standards like egg bennies ($10-$12), cinnamon raisin French toast ($8) and western omelette sandwiches ($11). Notably, there's not a slice of bread, English muffin or bagel in sight, in every instance the familiar dish is upgraded with the house waffles. 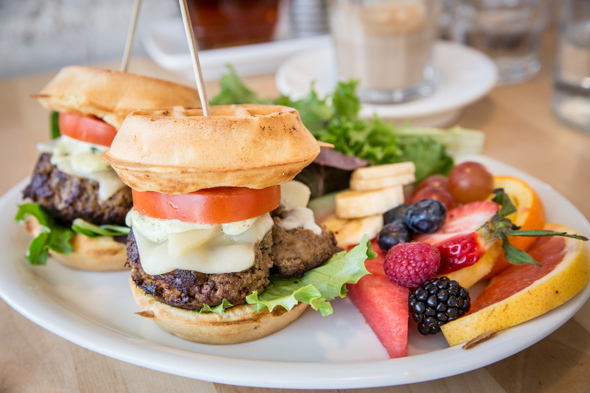 More unconventional uses include substituting waffles for burger buns in the case of the mini sliders ($15). Served two per order, 3 ounce beef patties are layered with havarti cheese, tomato slices, pesto and mustard mayo -- slathering the whole thing in syrup is not discouraged. Desserts served on mini-waffes hover at $5-$6 dollars each and come topped in flavours like s'mores, peanut butter & banana, and carmel pecan. I try the bigger (meant to be split), wafflized banana split ($8), a full-sized waffle with carmelized banana fused right into the batter and topped with house-made soft serve and sundae toppings. Starving Artist is open seven days a week from 9am to 9pm. 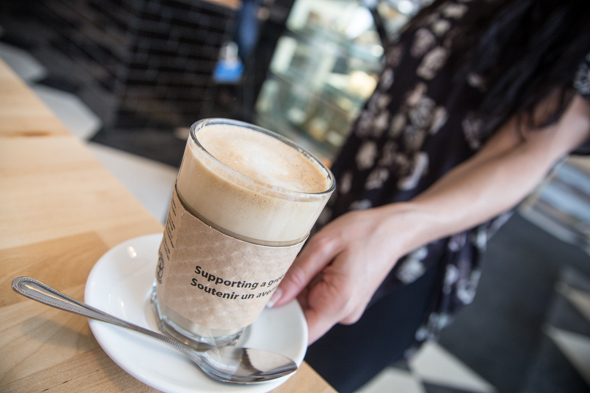 Espresso drinks are available for take-away, as is a selection of pastries and yogurts. 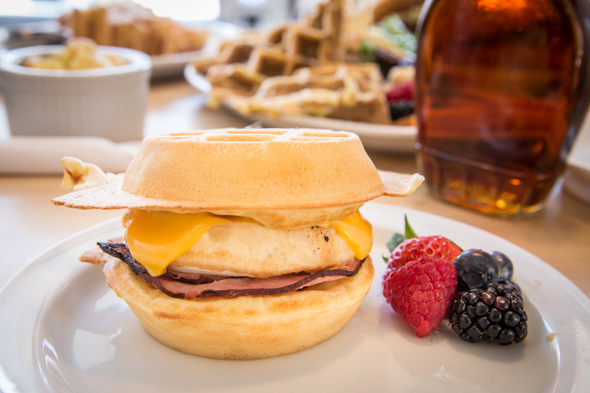 On weekdays only, breakfasts to-go ($4.50) are available with eggs, ham and processed cheese sandwiched between mini waffles.